Newsgur USA: Secretary of Security, the next one to leave? Secretary of Security, the next one to leave? Kirstjen Nielsen, the Secretary of Homeland Security may be the next official to resign or leave the White House if she does not improve her shots regarding her boss Donald Trump. National Security, one of the most sensitive issues, is currently red-hot inside the president's cabinet. The crusade against the emigrants continues being the algid point on which the American president requests more and more control, which is translated into more repressive work. A recent dispatch meeting to deal with issues related to emigration ended in a heated discussion between the US head of state and the Secretary of Homeland Security, and apparently, they did not reach an agreement. Border crossings remain a controversial issue in the debate table of Donald Trump's cabinet. The president has shown deep concern because of the increased number of arrests at the border, rather than being stopped by agents. The frustration lies on the fact that once the border is crossed by emigrants, a series of legal processes begin to emerge. Several legal issues of the legislative system of the United States undermine Trump's wishes to send back those who manage to reach the country. This, in part, is one of the explanations for which the American president is obsessed with reinforcing the wall with Mexico and the deployment of National Guard troops. Not in vain, he has repeated said emigration is National Security matter. From Trump’s point of view, Nielsen has not done much to diminish the figures. The reasons why she has not achieved that purpose have not convinced Trump who will surely ask for the resignation of his current Secretary of Homeland Security. The executive has a tendency to purge from his cabinet all those he considers incompetent, when the reality is that several of these "inept" ones are officials who have opposed his totalitarian approach. The New York Times, like others, has already speculated on the possible departure of Nielsen, something that the Department of Homeland Security denied. 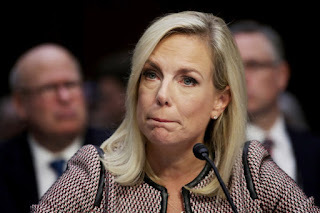 However, Nielsen has not denied that she and the president have divergent points of view about emigration and that indeed in the last meeting they had there were different criteria. Despite this, she admitted that indeed the president of the United States is right in many of his questions, to which she will continue paying attention to. Likewise, she added that one of the main concerns remains the existing legal loopholes and the Congress’ lack of action. One of those present at the meeting was the head of the White House office, John Kelly, who delegitimized the comments of the press by declaring that Nielsen was treated correctly, in an office he considered as profitable. Donald Trump is not the only person who has had confrontations with Nielsen; the Head of Immigration Customs Enforcement (ICE), Thomas Homan, has also faced the Secretary several times. The ICE is the entity in charge of overseeing migration issues and has a service of agents that have become a repressive arm against migrants. The Department of National Security has faced several critics, especially those related to migrants. The biggest national controversy is related to the elimination of the Deferred Action for Childhood Arrivals Program (DACA), which would end the aspiration to stay in the country of some 700,000 young people who arrived in the United States during their childhood. Among the weight that Nielsen carries on her shoulders, there is the effective and efficient implementation of the agenda proposed by the president on immigration matters, which are extremely controversial. Last month Attorney General Jeff Sessions said there would be zero tolerance against those who cross illegally. The “zero tolerance” order aims at stopping several of the legal loopholes that exist to avoid those that cross to settle in American ground. According to Sessions, the idea is to make more emphasis on filing illegal entry charges against immigrants. Currently, illegal entry into the United States is processed as a misdemeanor when it applies to immigrants who had not been detained by the border authorities. Only human traffickers are prosecuted for more serious crimes. Among the proposals of the current administration are short-time prison sentences and condemnations.